Spacebase DF-9’s development was tragically cut short due to an apparent “lack of funding”, but does this show in the finished product? Read our review to find out. If you look back through the treacherous terrain that is “Liam’s Portfolio of Games Writing”, you’ll find a lot of coverage of Double Fine games/activities. I’ve reviewed stuff they’ve made, stuff they’ve published, and I’ve taken part in voting for and funding both public Amnesia Fortnight projects. As a huge fan of their work, I’m often blown away by their ambition and unique voice in the industry, but I’m also just as likely to come away disappointed if a DF game doesn’t live up to Schafer and co.’s usually lofty standards. Of late, it has become apparent to many that Double Fine has finally bitten off more than it can chew. Having just released Hack ‘n’ Slash, Costume Quest 2 and Spacebase DF-9, the studio is still grappling with the development of Massive Chalice, Grim Fandango ReMastered and the second part of Broken Age. 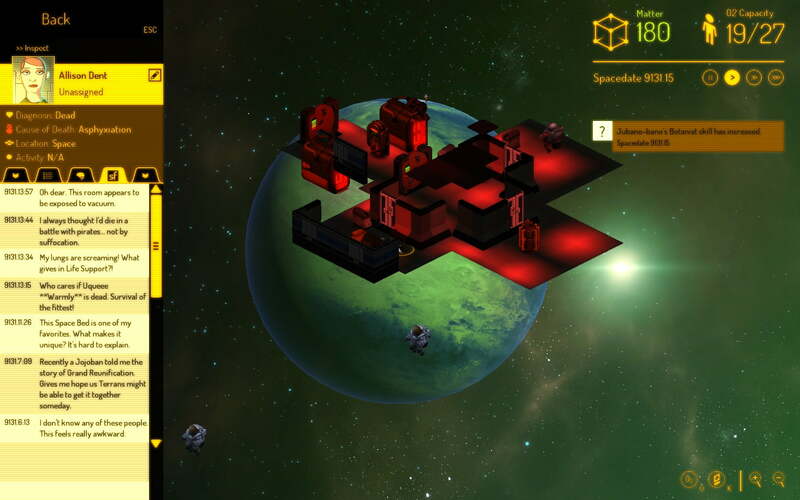 For a (relatively) small team of 65 developers, DF has undertaken massive amounts of work, and Spacebase DF-9 is clear proof of that – in more ways than one. Despite wielding, at its core, an inherently irresistible concept (build and maintain a goofy 1970s science fiction-esque space station), Spacebase often feels rushed and a little clumsily assembled. That’s not to say it isn’t a solid or noteworthy building sim, but its myriad flaws do restrict it from ever coming close to genre greats like Theme Hospital or even the more recent Prison Architect. 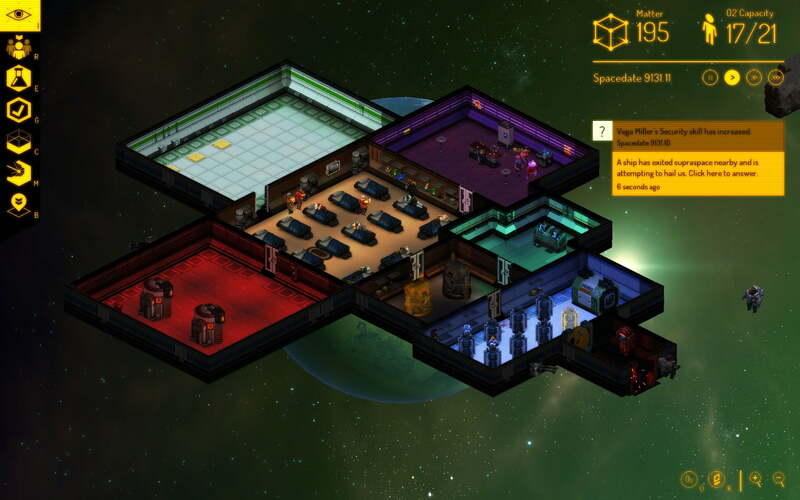 Spacebase’s clean, attractive layout unfortunately contributes towards its undoing. Your Spacebase begins life as a simple “Spaceseed” accompanied by three crew members. After building vital rooms like reactor zones and life support, a base can be expanded with more luxury areas like residential zones, pubs, gyms and gardens. Each zone serves a specific purpose, be it for survival, power or recreation, and the rigid placement and colour coding of said zones helps to keep things orderly and visually easy to follow. Zoning issues only arise after you’ve designated too much space to a zone that needs little (e.g. a gym room), since it’s impossible to separate or divide rooms into two different zones, and zone specific items can only be placed in their designated zones. Once you’re zoned up, there’s no going back – a fact that can be rather crippling if you’re in need of zone specific objects but don’t have the resources to build an entire room in which to house them. Jobs on the spacebase are best doled out to residents that are both willing and able to do it; two factors that are easily marked in the “roster” menu via smiley faces and star ratings. Similarly to zones, some jobs are vital for early base expansion, such as builders, technicians, and miners, whereas others are better saved for the late-game, like bartenders and botanists. 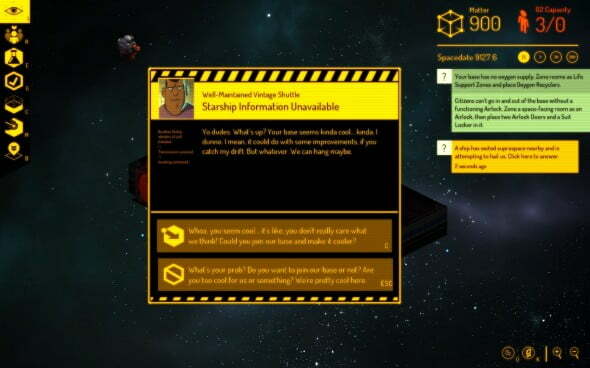 Spacebase‘s job system works really well, mainly because it’s strict enough to adhere to a set of simple rules, but it’s also flexible enough to allow for quick adaptation to new, unpredictable situations. If you’re suddenly boarded by a group of raiders, it’s likely you’ll want to throw your gardeners gloves aside and have your botanists take up arms in the security department. Spacebase certainly hits all the right notes with regards to that idiosyncratic Double Fine humour we’ve come to expect; messages from other ships take on many forms, but they’re always funny, and the game’s ingenious “SpaceFace” social network gives you a sneak peak at the innermost thoughts and musings of each crew member. Unfortunately, this may be one instance where laughter cannot save Double Fine from some questionable design choices. Where Spacebase first slips up is in trying to provide players with such a simple and un-intrusive user interface – a noble gesture, but one that ultimately backfires. A far cry from Prison Architect’s huge UI boxes, DF-9’s command tab is tucked away to the side, and specific commands can only be accessed by first sifting through multiple menus. Although this seems simpler at first glance, it’s actually rather cumbersome, particularly when mistakes are made, wrong commands are clicked, speed is of the essence etc. It even takes wading through three separate sub-menus to construct a simple door, such is the cumbersome design of the UI. A larger, albeit, more intrusive interface or Sims style “Build Mode”, would have made things much easier to master. This often problematic adherence to the implicit is reflected in DF-9’s moment-to-moment gameplay too. A lack of diegetic sound makes every action feel unresponsive and tame, particularly with regards to construction and combat. I know there’s no sound in the vacuum of space, but in a pressurized, oxygen-filled space-station? This means that the “eventful” parts of the game are nothing more than a bland inconvenience; raider fights and parasitic infestations should be exciting and refreshing, but instead they resemble awkward, silent Runescape enemy encounters. There are also far too many occurrences of residents simply relieving themselves of their responsibilities in favour of casually strolling around the station, leaving vital jobs unattended, as well as moments wherein tasks will are impossible to complete, but the game’s pop-up messaged give little or no indication as to why . When you’re more or less alone in the vastness of space, such insubordination and lack of explanation leaves you feeling helpless, frustrated and a little bored. DF-9‘s biggest crime is simply that it is unfinished. There aren’t enough emergent scenarios like spaceship encounters, derelicts, and raider attacks, and most of the scenarios that are included end up getting repeated three or four times inside the first two hours of play. In terms of production values, DF-9 isn’t ugly, but its character models, portraits and animations could certainly use some polishing and fleshing out. In fact, similarly to the emergent encounters and the game’s serviceable synth soundtrack ripped straight out of the Mass Effect galactic map, most of the game’s assets end up getting repeated over and over again. For a game about a diverse, alien space station, everything in Spacebase feels rather same-y. Ultimately, this means Double Fine’s latest effort is an occasionally interesting, but unbalanced simulator. The early-game is an exciting but frenetic affair, thanks to the initial unpredictability of the game’s emergent scenarios, as well as its rather unwieldy UI. Then the late-game is a fairly mundane management simulator which merely requires you to continue expanding the size of your base, albeit with very few new upgrades available, and a disappointing amount of cloned assets and scenarios to play with. Unfortunately for Double Fine: in space, no one can hear you laugh. Despite its humour and its occasional sparks of brilliance, Spacebase DF-9's awkward user interface and overly repetitive scenarios make it a fairly average, albeit interesting building simulator. Spacebase is simply lacking in both the quality and density most simulation games have to offer. the game was fun, kinda unique but sadly it needed more. that was it’s flaw. not enough stuff to build, not enough things to happen on your base. frankly a lot of the events (such as asteroids hitting your base) was more annoying than cool. I wish I could recommend it.